in Good Ideas Gone Bad, Sugar and Spite, Dinner, Sweet! It’s not like I had any real attachment to my Irish heritage. Apart from having the gift of gab and a penchant for drinking and a wee little bit of a temper, I’ve never claimed much celtic pride myself. But it may well explain my inability to cook. Since when did Irish women ever cook well? (besides my cousin, I hasten to add) It’s not like anyone would dare say so to their faces…. I actually gave this the benefit of the doubt and tried it not once, but twice…thinking that the first time I messed up something by trying to halve it. But no. The second time that same night I tried the recipe word for word and still it turned out too sticky to work with. In other words, a bloody mess. Is it me? Or is it me trying to do an Irish recipe? That’s like culinary double indemnity, isn’t it? I just wanted to release the faeries and feel like I was doing something, you know, ethnic. Now Mark Bittman’s buttermilk biscuits, on the other hand, ROCKED my household. For the three of you out there who DO NOT own a food processor: Mix the dry ingredients together (I sifted them. I have one of those). Cut the butter into little pieces work it into the flour like you would for pastry. 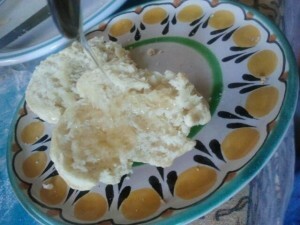 When the butter is all blended, make a little well and pour the buttermilk in there. Use a spoon to mix it all until it’s just a ball. Turn it out onto a lightly floured surface and kneed 10 times. No more, no less. Using your hands, press this into a 3/4 inch thick rectangle and cut your biscuits with the lip of a glass. Place the rounds on an ungreased cookie sheet. 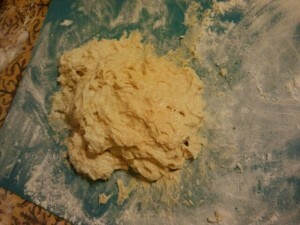 Gently gather up the remaining dough and cut more. 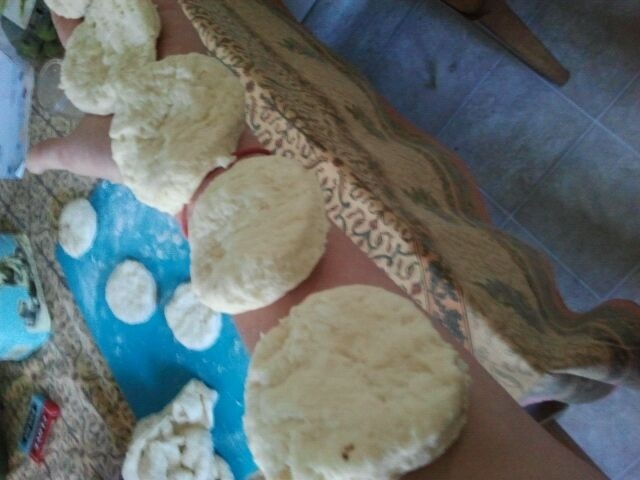 This recipe made 15 biscuits. Bake 7 to 9 minutes until golden brown. Eat these within 15 minutes for best result. No worries there. The kids and their friends fell on them. There wasn’t a single one left 20 minutes later. No joke. I only got to eat two because I snapped them out from underneath the clamoring 11-year olds. I’m lucky my digits are all intact. This means that the kids were either starving when I served them, or the warm, fresh, buttermilk biscuits were really, really yumm. I’m gonna go with the latter, thanks. And you should have seen them once one of them thought to drip honey into the warm insides of these biscuits. I mean, when do 11-year-olds actually thank you repeatedly for anything? Aye and you tell me, then. Maybe lesson is you need a Jew to help make Irish food? As the product of a Jewish mother and an Irish stepfather, I can tell you that the two religions do merge quite nicely in the kitchen.